Everything you need to create and deliver DIY, one, two and three day, "make-a-difference" training sessions. A primary reason for a lean transformation failure is lack of effective training. It's not an "add water and stir" business process. You can't just decide one day to become lean and think it will happen overnight. You need to determine what constraints are impeding your ability to increase speed, improve quality, and eliminate non-value-added activities. And, then you need to develop and implement lean concepts and tools for identifying and eliminating their root causes. The first challenge of a training program is how to rally company-wide support of and commitment to its lean manufacturing initiative. To achieve that, your Lean Manufacturing Training Package must first and foremost communicate the need for the change, the involvement required, and the need for a company-wide commitment. Simulation exercises demonstrating the "before and after" the initiative are an excellent solution to this challenge. Thank you for your permission. We have already purchas-ed and used the lean Manufacturing Simulation Game and have found it of great value in demonstrating lean concepts. 5. Master the BASICS of lean manufacturing? 6. Exceed your goals and expectations? 7. Gain recognition, promotions, and salary increases? 1. Improve customer responsiveness and satisfaction? 2. Optimize MRP/ERP and manufacturing processes? 3. Increase speed and improve quality? 5. Eliminate the high cost of overtime, scrap, and rework? 6. Improve customer on-time delivery of high quality products? 7. Gain control of inventories and optimize their turnover? 8. Increase team contribution to the company's "bottom line?" If you answered yes to any of the about questions, you're time spent on this Web page will be a very valuable investment. If you've ever said, "There must be a better way." ... there is, and it's not more computerization! In their efforts to draw closer to customers, many manufacturers have lost focus on what should be a company�s primary success factor � mastering the basics of their business and profession. Like Vince Lombardi, who achieved success by having his team focus on the mastery of football basics, we need to have our manufacturing teams identify and master the basics of lean manufacturing. No lean manufacturing transformation will exceed expectations without indentifying and mastering the 8-Basics of Kaizen Based Lean Manufacturing�. "Do you want to optimize your lean transformation success? If so, you need to identify and master the basics of lean manufacturing. Many historic, recurring day-to-day problems (perhaps the same problems that plague your operation) can be permanently eliminated by a tenacious execution of Bill Gaw's "8-Basics of Kaizen Based Lean Manufacturing�." * 8-Basics for reducing work place stress. 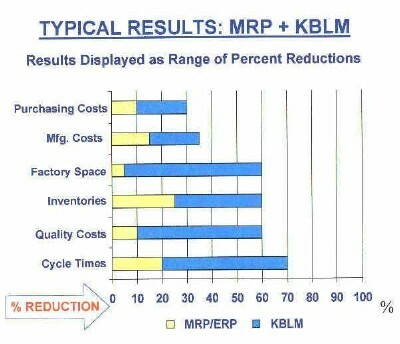 Kaizen Based Lean Manufacturing� (KBLM) does not replace the MRP system but rather optimizes its shop floor and purchasing sub-systems. 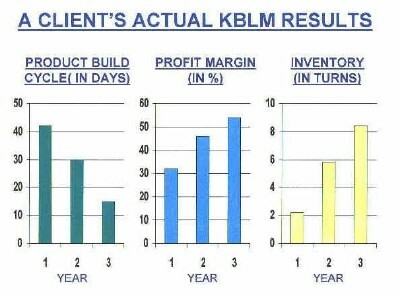 KBLM methodology can generate two to three times MRP cost reductions while producing significant improvement in quality and customer satisfaction. For more than 13 years, our 1700 plus Customers and 15,000 plus MBBP Bulletin Subscribers have looked to Bill Gaw as a trusted developer of Power-Point-Plus tutorials and training programs. Training materials that help improve the spirit and performance of individuals, teams, and organizations. Most training materials today are Videos/Webinars that tell you what to do but with very little practical implementation and/or optimization �know how.� Videos/Webinars present their story at a fast pace but most viewer�s retention rate is less than 25% and videos and webinars perform poorly as a reference document. 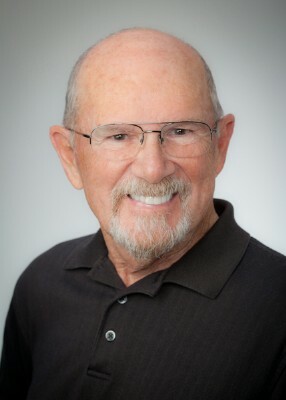 Bill Gaw's tutorials and training modules on the other hand include powerful, Power-Point charts and graphics, "plus" annotated note pages with "slide commentary" and "lessons learned" by a "been there, done that" operations professional. A value added, learning experience on "how to" design, implement and optimize a lean manufacturing initiative for individual and company success. Our customers study the tutorial and T-modules content, print relevant sections, and highlight passages that are important to understanding and executing their change initiatives. The resultant blueprint is used for training and empowering their procurement team in their pursuit of inventory and supply chain performance objectives. 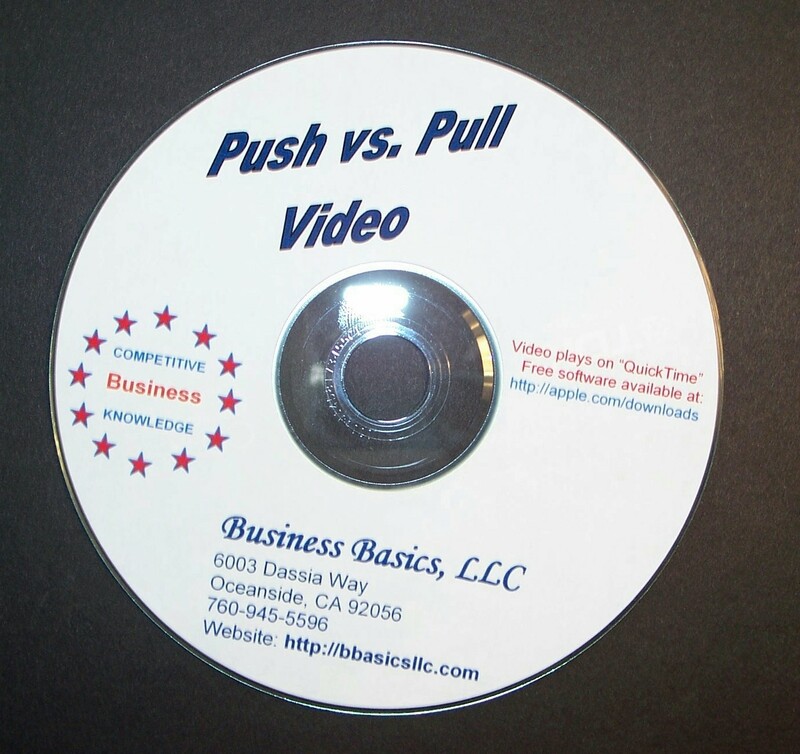 Videos/Webinars don�t provide the same capabilities and their performance results are minimal. One of the keys to success is having a great coach. Whether you're in the trenches or working your way up the company ladder, the experience of someone who's "been there, done that" can be invaluable. Throughout his training material Bill Gaw provides expert knowledge, support, empathy, respect and most important, the wisdom of experience. And, he's always just an email away. Another plus is that your training package will include a "Train-the-Trainer" Manual should your training leader needs some help in facilitating "make-a-difference" training secessions. Without data, you�re just another opinion. That says it all. To continuously improve our processes, we need to first learn how to capture and then apply statistical data to our situation analysis. This action is a primary requisite to effective problem solving. 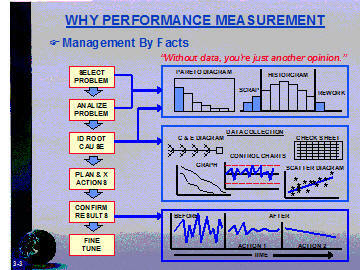 Slide 3-3 presents an overview of a management by facts system. Lesson Learned: The more that people use real time data to perform situation analysis and to establish and track corrective actions, the more comfortable and effective they become at interpreting and applying data-on-the-run. It is my contention that exceptional leaders make quick and quality decisions because they have mastered the skill of interpreting data-on-the-run. However, when a leader says, �That doesn�t sound right to me. What about .. . . .?� He has put to use, what I call, the test of reasonableness and this ability separ-ates the exceptional leaders from the pack. To develop the ability to apply the �test of reasonableness,� a leader must first become an expert at interpreting data-on-the-run. The following slides will show you how. If you were watching a video, attending a seminar, or a webinar would you be able to take down the above in your notes for later reference... I don't think so. With Bill Gaw's approach, there is no need to take notes because you have the training slides, slide commentary, and "lessons learned" for future reference and organizational training. "Bill Gaw's training is focused on the "how to." Unlike other training material that tell you only what you need to do... Bill's training presents what you need to do and then he shows you how to do it. 3. CD - Strategic Planning T-Module Strategic planning is a business process that many companies employ to identify their strategic objectives and critical success targets Establishing Lean Manufacturing as a strategic planning objective is a major step toward reaching a company's full growth and earning potentials. 4. CD - Thinking Outside the Box e-Book - Creative thinking skills are required by everybody. Each and everyone needs to continuously challenge and expand their ways of thinking to enhance personal and business success. 5. CD - Value Stream Mapping T-Module - Maps and flowcharts help make work visible. Increased visibility improves communication and understanding, and provides a common frame of reference for those involved with improving business and work process. Value Stream Mapping and Gap Analysis should be the first step to the implementation of Lean Manufacturing. 6. CD - Kaizen Manufacturing T-Module - If your business team can handle only one strategic initiative at a time, then let it be the implementation of a �quick-hitting� continuous improvement initiative. There just isn�t any other more important package in our pursuit of profits. 7. CD - Quality System Toolbox - Provides an interactive ISO 9001 checklist and quality manual and procedures to jump-start or re-ignite a company's quality manufacturing initiative. Provides a quality manufacturing roadmap to optimize prior quality efforts and maintain a focus on improving quality. Much less than you would imagine. In fact, we make the "Lean Manufacturing, Training Program-in-a-Box" affordable so that it can fit easily within your company's training budget. We want you and your company to have the best Lean Manufacturing Training Package available and the best way to do that is to make it affordable. Order your Lean Manufacturing Training Program-in-a-box today at a special price of only $596.00. That's a 49% savings and thousands of dollars less than the price of attending a relevant workshop. With Mr. Gaw's game instructions and training module expert commentary and "lessons learned" it's like having a Lean Manufacturing Champion, guide you personally through his Lean Manufacturing methodology. And, you'll have all the training materials for future reference; not just a memory of the last seminar/Webinar. For more than 14 years, Our Customers have looked to Business Basics as a trusted developer of manufacturing training materials and workshops. Training options that help improve the spirit and performance of individuals, teams, and organizations. 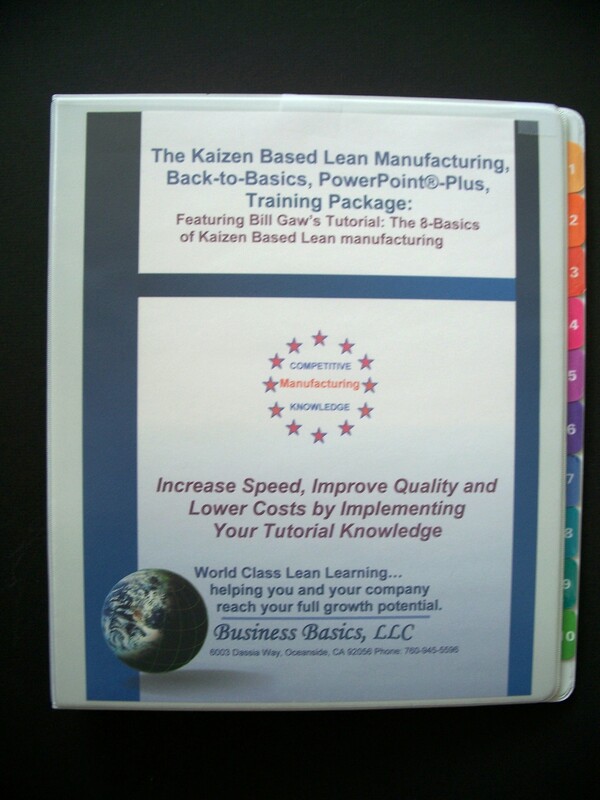 "Bill Gaw's Lean Manufacturing DIY Training Package is focused on the "how to." Unlike other training materials that tell you only what you need to do... Bill presents what you need to do and then shows you how to do it." We are so sure that your Lean Manufacturing, Back-to-Basics, DIY-Training Package will have the impact you desire that you can order entirely at our risk. The Lean Manufacturing, Training Program-in-a-Box comes with a No Risk, 100% Unconditional Money-Back Guarantee. This is a Lifetime 100% Money- Back Guarantee! Believe this, we will never consider your purchase binding until you have used the Lean Manufacturing, Training Program-in-a-Box and put it into practice. We know that you, like our other customers, will be thrilled with the results. In fact, we are so convinced that your Lean Manufacturing, DIY, Training Program will work for you that if you aren't completely satisfied for any reason at any time, simply return only the LEGO game for an immediate refund of your purchase price. You simply can't lose. Remember, if you continue to work the same way, you're going to get the same results. The next move is up to you. I've shown you that our training tool is as risk free as an offer can come. You and I know that if you've read this far, you're seriously interested in improving your manufacturing training package and helping yourself and your company achieve their full growth and earnings potential.